Change up your core workouts. So late last night I was watching Tony Gentilcore‘s video presentation, “Avoiding Common Programming Bloops and Blunders.” You can find his presentation along with many others on Muscle Imbalances Revealed, which can be found here. While watching his presentation, I got a new idea for a blog post. “Recently McGill examined 12 young men, with the laboratory technique described previously, and observed no major difference in lumbar load as the result of bending the knees (average moment of 65 Nm in both straight and bent knees, Compression: 3230N-straight legs, 3410N-bent knees; Shear: 260N-straight legs, 300N-bent knees). Compressive loads in excess of 3000N certainly raises questions of safety for some patients. This type of quantitative analysis is necessary to demonstrate that the issue of performing situps using bent knees or straight legs is probably not as important as the issue of whether to prescribe situps at all!” (McGill). Take the bolded statement above into consideration. Perhaps doing sit-ups with a 45lb weight or medicine ball isn’t a good idea. Although there aren’t many studies done documenting this, I think it would be better to play this safe than sorry. Taking from Tony Gentilcore’s presentation, there are two ways to essentially train your core. There are strength vs stability. Strength is exactly what it sounds like; doing crunches and being able to flex with more weight. But there’s another side to the same coin, stability. Tony phrases core stability as, “the ability to resist unwanted motion.” Most people are familiar with core strength, but not stability, which is important in any sport. Key notes: You don’t have to rotate is a circular motion off to the sides like in the video (although it’s a great way to train as well, which will lead me to my next point). You can go straight up and down in a traditional medicine ball slam. Now when doing this, it’s important to extend all the way up and slam the ball down into the ground as hard as you can. It’s called a medicine ball slam for a reason, not medicine ball drop. 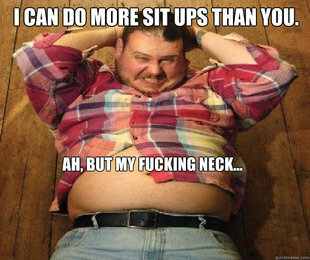 Crunches only work in one plane of existence; you’re just moving up and down. If you’re and athlete, you’re not just moving in one plane (two dimensions), but in three different dimensions. If you’re living and playing in three dimensions, train your muscles in those three dimensions. Almost everyone has heard or done this move, but are you doing it correctly? The key to a proper plank is to have the whole body inline, just as if you were about to do a push-up. Engage the core and glutes to keep your hips from sagging, this is the anti-extension part of the exercise. If you don’t know what I’m talking about, read my push-up article here. You can either do a high plank (like from the starting push-up position) or low plank, which is on your elbows and the more common of the two. The great thing about this exercise is that you can do them in the cable machines like in the video above, or use the simple resistance band tubing. If your gym doesn’t have any tubing, you can get some here. Don’t let the weight pull you. Remember, this is an anti-rotation exercise, so resist the pull by engaging your core. Hold your arms out straight for a second to make it a little tougher on yourself; don’t blaze through this fast, that’s counterproductive. This exercise may look easy, but when you actually try it, you’ll be surprised how much effort you’ll need to do to provide anti-rotations. 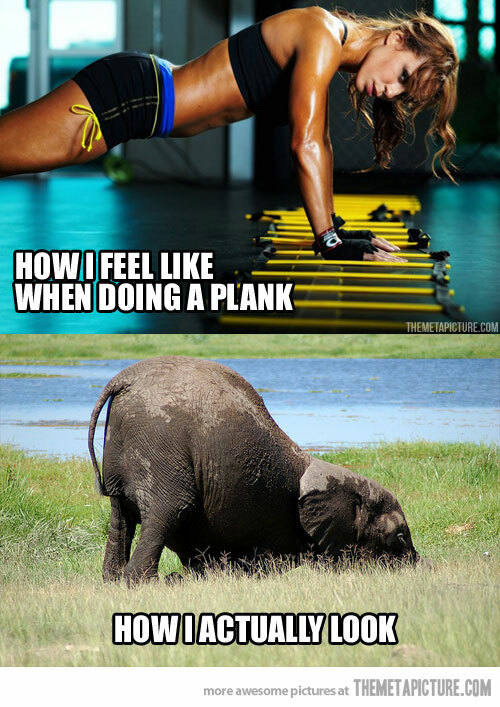 Just like the regular plank, except you’re on your sides (elbows or hands). Same technique applies, engage your core and don’t let your hips sag. If your gym doesn’t have medicine balls (or doesn’t allow you to throw them and blow off steam) or you already do these, try doing one arm variations of your favorite exercises like a one-arm dumbbell bench press or one-arm dumbbell farmers walk. While the core is not the main muscle being used, it’s still is being worked. It’s a great way to kill two birds with one stone. Key notes: Big chest and shoulders back. A great way to kill multiple birds with one stone. It simultaneously works your core, your posture and grip strength. A big shout out to Tony Gentilcore’s presentation. As you can see, I learned a lot and I’m trying to apply, use and see what works for me. If I don’t remember all the cool little tidbits in the presentation, I know for a fact that I’m a “chef” when it comes to the strength and conditioning world. So, what do you think? Have any other exercises that you love to use? Leave and comments, questions or concerns in the box below.